High-Fiving and Fist Pumping! Ladies Night at Peak Cycles was a WIN! 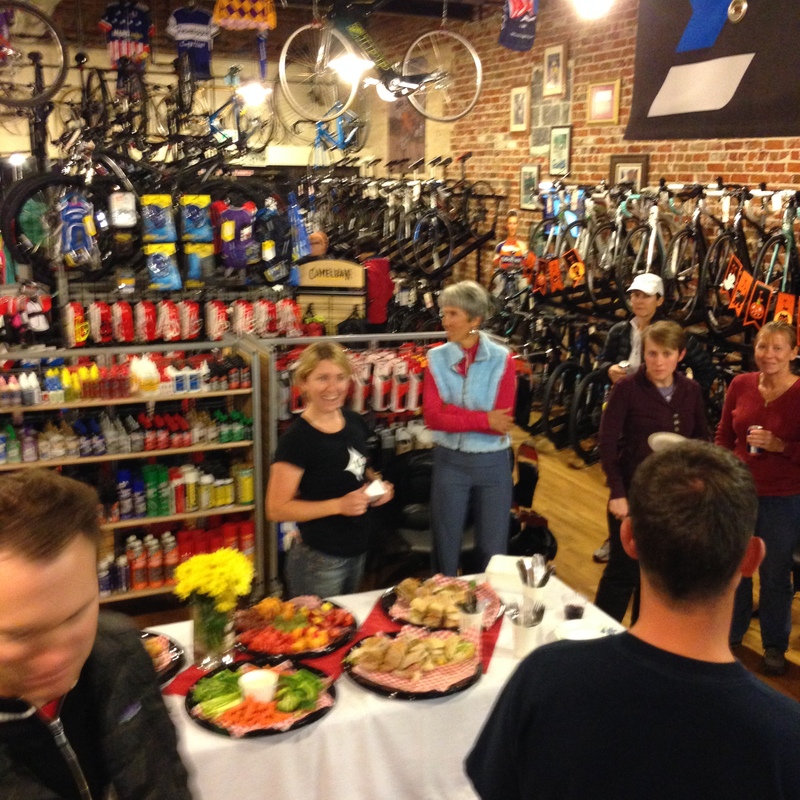 Good times were had this past Monday evening at Peak Cycles Bicycle Shop! Women filled the shop to enjoy a fun and relaxing evening while making friends with new riding buddies, shopping for the new cold weather cycling apparel, and talking about our favorite subject – Bikes! We’d like to thank all of our lady cyclist for making the evening a great success. In case you missed it, here’s what you missed! Stacy from Specialized talked with us about how bike fit is important. Specialized Bikes focuses on comfort for their riders and use body geometry to design their bike parts, saddles and accessories (even gloves). Good to know! Next, George Mullen shared with us why a bike fit is so important. With so many different approaches to bike fits, George shared how his goal is to connect people to the bike – not fit the bike to the person! Comfort rules! And, George’s vast experience and approachable nature made it super easy to ask questions. You can get your bike fit questions answered too. In fact, this time of a year is a great time to do a fit consult. Finally, the evening wouldn’t have been complete without bling! Which road bike caught our eye? The Specialized Ruby – a great road bike. What made it so great? It’s a comfortable ride and a comfortable fit. Need a visual fix? Check out our pictures on Facebook to get a glimpse of the fun event. A huge shout out to Shimano, Specialized, Endura and POC for the goodies, raffles, and support. And, tons of cowbell cheer to our Ladies for joining us! Sipping wine, talking bike parts, and making new riding buddies – what more could you want on a Monday night? So, don’t miss the next one! Like us on Facebook, follow on Twitter, and stay connected on Google+. This entry was posted on Thursday, October 31st, 2013 at 4:58 AM and is filed under Peak Cycles Bicycle Shop. You can follow any responses to this entry through the RSS 2.0 feed. You can leave a response, or trackback from your own site.